Alphonso Johnson and other exciting events/performances! It’s been another busy and exciting year! Although I haven’t had much time to post lately I’d like to share highlights about some wonderful concerts and events. On March 12th at the Museum of Making Music in Carlsbad, CA I was honored and thrilled to perform with legendary bass player, composer, and bandleader Alphonso Johnson. For anyone who doesn’t already know, he’s recorded with Weather Report, Carlos Santana, Phil Collins, Bob Weir & Michael Jackson to name just a few… He’s also an incredibly kind, humble and caring person. In an era when musicians are often only able to get together for a quick rehearsals before a gig, this one was unique; we rehearsed with Alphonso in small groups for nearly 6 months. During that time a variety of tunes and arrangements were explored. The end result was a concert that touched on many of the era’s of Alphonso’s storied career. I was extremely honored when Alphonso asked me to do an arrangement of Sakura which we performed as a duet; electric bass and koto. The musicians that played in the band were without exception phenomenal! It was such a thrill to perform with them and I hope we can do it again. I was hired by the Energic Corporation to perform for their annual worldwide conference in Las Vegas on July 28th. For the event I invited my brother, Hirotaka Ogawa to perform with me. Hirotaka flew out from Japan and we had a wonderful time! His arrangement of First Trial, from our Beyond the Space CD, included internationally recognized, award winning, shamisen player Mike Penny. I’ll post a video soon! Currently I’m working on several exciting performances including Genji with music composed by Koji Nakano and Seeds, a multifaceted Japanese cultural performance. 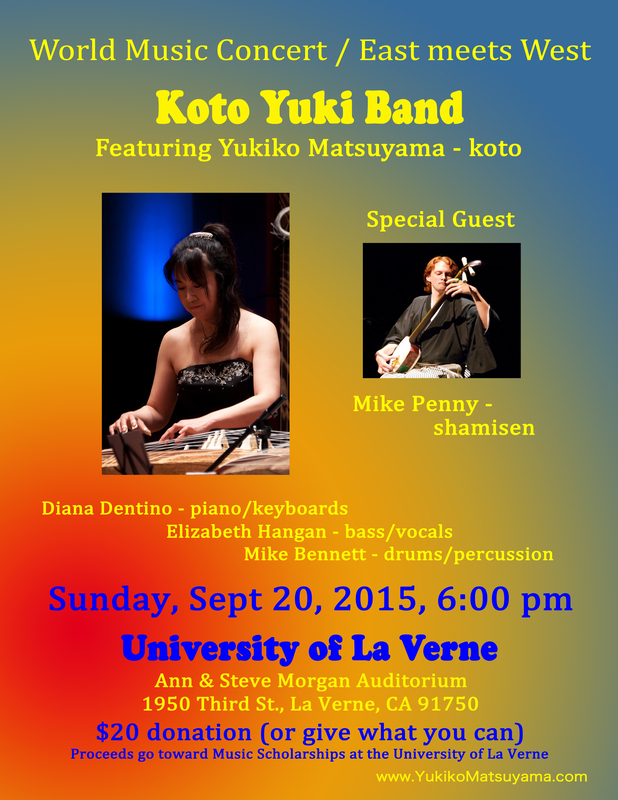 We’ll perform Genjiat Scripps College in Claremont on Oct 29th. Seeds will be performed at the Armstrong Theater in Torrance on January 14th, 2017. Check back here and on my Facebook page for more information about both! Next March I’m very excited to be performing with jazz bass legend Alphonso Johnson and his incredible band. And when I say incredible, I’m not exaggerating. We’ve begun rehearsals and the musicians are all amazing! I feel honored to be part of this project and hope to see many of you there. Check back next month and I’ll post some more details. Performing at the University of La Verne is always a special occasion and the remodeled Morgan Auditorium is spectacular. This time my band will be joined by a very special guest, vituoso Shamisen musician Mike Penny. Mark it on your calendar as it promises to be an evening filled with new songs, friends and even a few surprises! 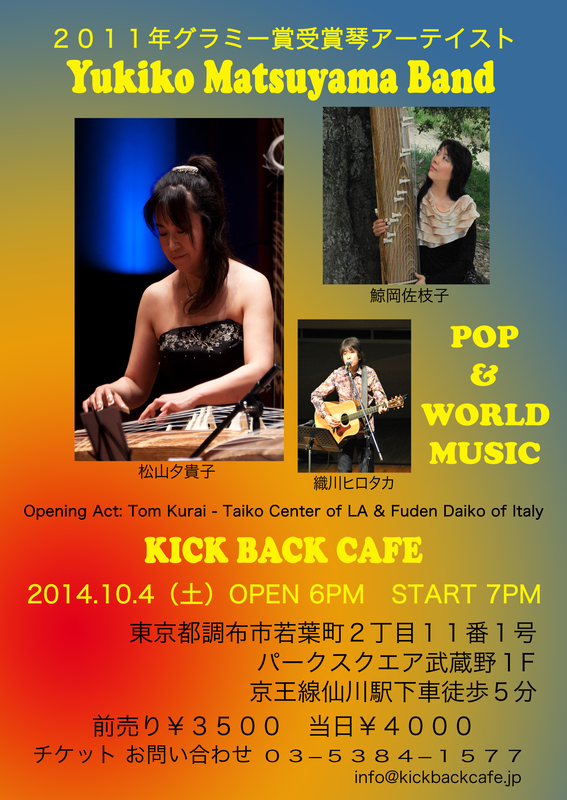 Join us in Japan at the Kick Back Cafe! Hope you can join us for an evening of Pop & World Music at a the Kick Back Cafe, a very cool club in Tokyo. Click to see the poster. We’ve been invited to play a very special performance in Alaska on July 11th. Hirotaka will fly from Japan to California where Diana & I will meet up with him and we’ll all fly to Alaska. We’re really looking forward to this one! Tickets on sale Friday, May 23rd. We’ll post more info about the musicians and current projects they’re working on shortly. Please use the contact page to be added to our mailing list for upcoming events. 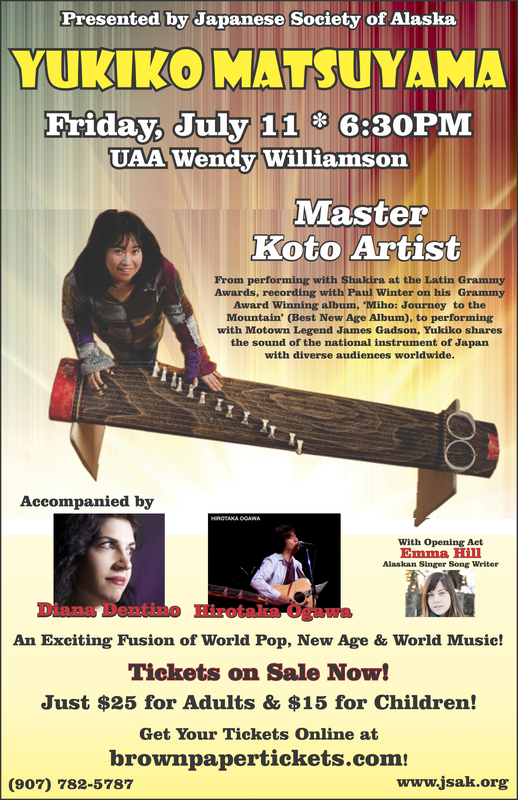 Internationally acclaimed koto artist Yukiko Matsuyama and a few special friends – legendary drummer James Gadson, sizzling saxophonist Greg Vail, Def Leppard’s rocking guitarist Phil Collen and djembe drum master Steve Biondo – will present a “World Music, Rhythm-and-Blues and A Little Funk” concert at the University of La Verne’s Morgan Auditorium at 7:30 p.m. on Aug. 17. 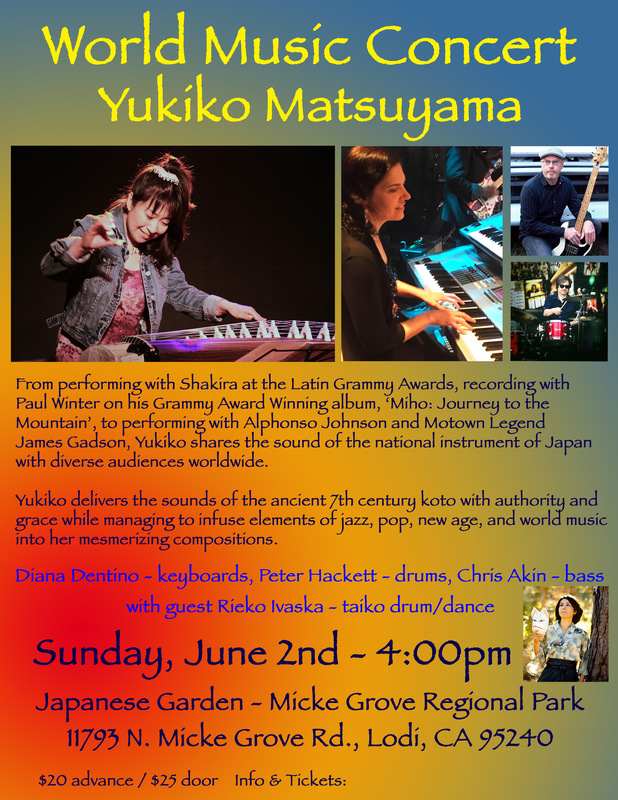 Matsuyama will augment her own band with guests Gadson on traditional drums; Vail on alto, tenor and soprano saxophone; Vince van Trigt on bass; Biondo on percussions, Diana Dentino on keyboards; Collen on electric guitar and vocals and master taiko drummer Hiro Hayashida. Tickets are $15 in advance and $20 at the door. Advance tickets may be purchased at http://www.KotoYuki.eventbrite.com. The concert will feature the diverse expertise and experience performers possessed naturally and fine tuned while playing with pioneering and famous artists on world stages, award-winning albums and popular productions. Gadson was a teenager when he followed in his father’s footsteps and picked the drums as his instrument of choice. He began his professional career in Los Angeles with the 1960s funk group Dyke and The Blazers and later became a founding member of Charles Wright’s Watts 103rd Street Band. Entertainer Bill Cosby helped him secure a recording contract with Warner Bros. Legends he’s played with include Marvin Gaye, Ray Charles, Herbie Hancock, B.B. King, Paul McCartney, Quincy Jones, The Temptations, Albert King, Bill Withers, The Isley Brothers, Joe Cocker, bluesman Willie Dixon’s grandson Alex Dixon, Beck, Lalo Schifrin, Blue Mitchell and Justin Timberlake. Matsuyama blends world, jazz, new age and pop music on the koto, a 13-stringed, 7th-century Japanese instrument. A child prodigy, the Osaka, Japan native started her classical training at the Ikuta School of Koto when she was 9. She moved to Los Angeles in 1993 and began composing original works which blended world and western music. 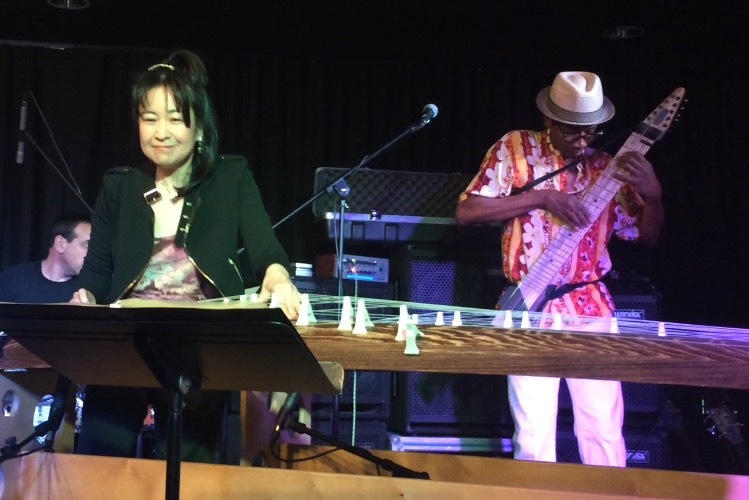 Matsuyama blends koto and world rhythms on her CD “Creme Brulee.” She has played with master pianists Reed Gratz and Billy Mitchell and drummer Michael Bennett. “Beyond The Space,” her latest project, is an international pop collaboration with Hirotaka Ogawa. Influenced by Motown, the Rolling Stones, glam and hard rock, punk and anything with a flair, Collen became a musical icon as lead guitarist of the multple-platinum-selling rock band Def Leppard. He was only 14 when a cousin took him to see Deep Purple, a concert that prompted him to start begging for a guitar. He got it at age 16 and started emulating the flashy, aggressive styles of Jimi Hendrix, Ritchie Blackmore and Mick Ronson. His own creativity made him a pivotal player in Def Leppard, starting with the group’s 1982 breakthrough album “Pyromania.” He and best friend Steve Clark’s classic harmonious guitar playing became the band’s signature sound. 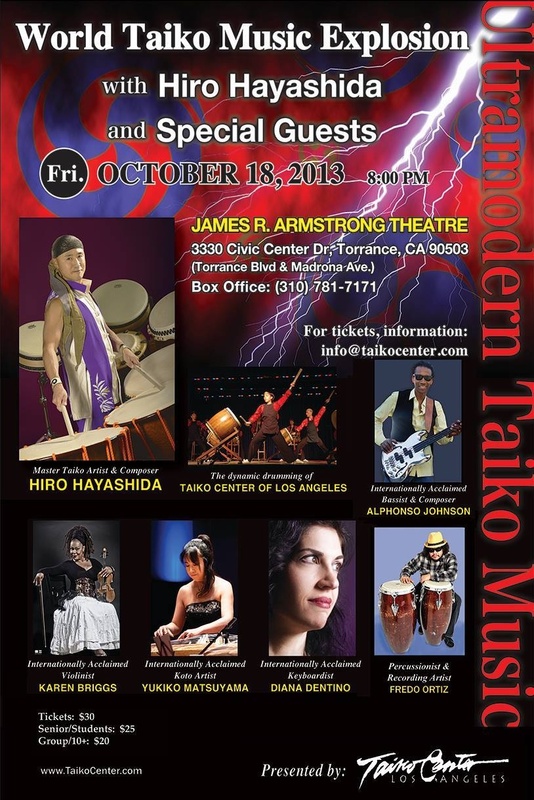 Hayashida was a featured player from 1985 to 1992 in Kodo, an internationally renowned taiko group. A composer, arranger, taiko director and award-winning drum designer, he has performed at the World Cup, UNESCO’s World Heritage and the Japanese Academy Awards. Dentino has studied piano since she was 5, earned a degree in music from UCLA and performed with Peabo Bryson, James Ingram, Jeffrey Osborne, George Duke, Oleta Adams, Sheena Easton, Jon Secada, Regina Belle, Deniece Williams, Kitaro and Chante Moore. Biondo comes from a musical family and started playing drums when he was 10. Within two years, he was skilled enough to be accepted into the Lynwood Diplomats, a youth drum and bugle corps. The diverse sounds of jazz, blues, Cuban and classic rock music he heard in the family home influenced his musical range. He later added African rhythms to his repertoire and founded ULV’s West African Drum Ensemble.